Tiki Oasis, the long running event built around music, rum and much much more, sets down on our planet from August 13 through August 16 2015 with the theme of Yesterday’s Future, Today. This four-day tribute to the Space Age covers everything from Outer Space Rock to Jet Age cocktails, symposiums about popular Space TV shows and more. 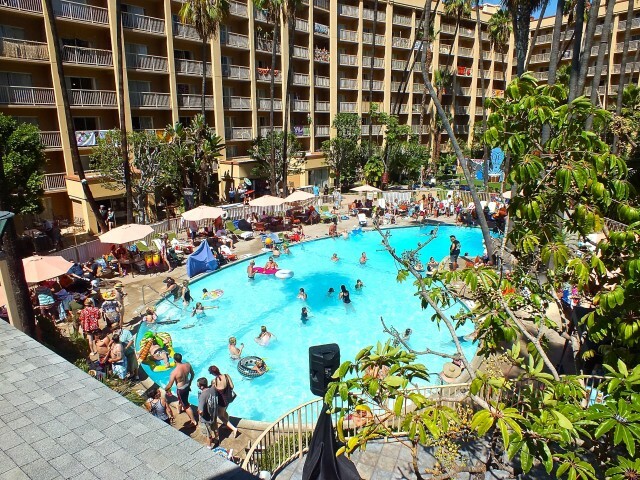 Tiki Oasis will be taking place at the Crowne Plaza Hotel in San Diego’s Mission Valley. Baby Doe and Otto Von Stroheim. Photo by Ed Simon for The Los Angeles Beat. 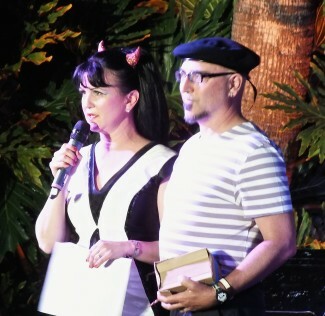 Otto von Stroheim is the producer of Tiki Oasis along with his wife Baby Doe. 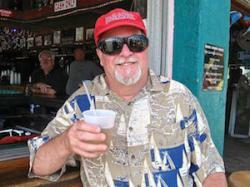 Just as importantly, he is the founder of Tiki Oasis and strives to keep it fresh every year. I caught up with Otto the other day and asked him some questions about the upcoming event. Q: 15 years in, did you envision that Tiki Oasis would become a small city? No! We started at a much smaller hotel and I’d always envisioned it as just a backyard party and kind of a small tribe. I knew the tribe would grow, but I didn’t expect that it would take on the proportions that it did. The cool thing about it is that individuals are doing their own thing. There are things that I’m not even aware are happening, people are—like for example, these guys are wearing cabana outfits, setting up on the side of the pool, getting their picture taken and then they’re posting it on their Facebook page. We didn’t organize that—-we love it, it’s great and we would have organized it but somebody else did and that’s great and they’re doing it, so it is like a village because there are people creating their own little communities within the village. Q: Tiki culture and the space age seem at opposite ends of the spectrum. How did they come together? Well, they existed at the same time in the same places. In Los Angeles, in World’s Fairs like the New York World’s Fair and the Disney Pavilion. And you’re right, they’re kind of polar opposites, but opposites attract, so people that are into Polynesian stuff now or tiki stuff now are also very heavily into Mid-Century Modern and Space Age stuff. For us, they go hand-in-hand. Obviously, at the time, if you were a scientist or something, you weren’t trying to build a raft like Thor Heyerdahl and Kon Tiki. Building a raft or building a rocket are two different spectrums but, for us now, looking back on that, they were going on at the same time and people were interested in both of those. They go together really well and people are really excited about it. Q: Disneyland had a role in Tiki Culture and also popularizing the Space Age. Why do you think that is? I grew up in LA and went to Disneyland at least once a year as far back as I can remember. Disneyland was covering different aspects of our world. They were concurrent aspects; space travel was hot and looking into the future and futuristic technology. But also, discovering primitives and primitivism and looking at the jungle or the lost island or another land that’s far away and then travel was big right then, right when Disney started was just before jet planes and jet travel became accessible to modern, everyday man—-your average citizen. The general public could take advantage of travel and leisure and could do things like travel to Cape Canaveral and watch rockets being launched into space. Or they could get on a jet plane and travel to Hawaii. So I think Disneyland was just capturing the ethos of the time and they were very forward-thinking. They were 10 years ahead of their time. The different ‘lands’ were represented, Europe was represented in the Matterhorn and Disney cartoons were represented in the kiddie area with Snow White. Then you have Adventureland which has Daniel Boone, Davey Crockett, the Jungle Ride and the Tiki Room. The Tiki Room of course has all those masks over it, you enter under some safari African art, so you’re entering a different world. The same thing happens when you are walking around the park and you go into Tomorrowland. You’ve got this huge rocket and all this weird technological-looking stuff. Q: Did you enjoy science-fiction when you were growing up? Lost in Space and Star Trek on TV were a huge influence on me. As far as cartoons go, the Jetsons and the Flintstones……just like living in LA, with Tiki stuff all around me, with the Tiki bars and Tiki landscaping and then Googie restaurants like Norms, also the Space-Age stuff is all around you, like all the NASA stuff and Apollo, cartoons like the Jetsons and TV shows like Lost in Space. It was all around you, so it was kind of embedded in my psyche. Q: What do the Symposiums offer for guests? In general, we have a cocktail one, we have a luau one, we have dance and exercise classes like yoga, so we have these different categories. We have music, architecture, and then film. But each year, because of the theme, we’ll have theme-specific symposiums, so this year, we have a guy named Danny Biederman. He’s actually a spy expert, but he’s a gadget expert also so he has a huge collection of spy gadgets which plays into the futurism and the technology aspect of sci-fi and futurism, what we’re calling ‘Tomorrowland’. So he’ll be displaying these gadgets that you’ve seen on Man from Uncle or other space-related shows, not Star Trek but earlier shows like Lost in Space. He’s a really interesting guy to be able to talk about that kind of stuff. We have Don Preston, the guy who very early on, like in the 50’s, did some electronic keyboards and then he used them when he played with the Mothers of Invention on their second through fourth albums I think. Q: What are some of the interesting symposiums? We have Will “The Thrill” Viharo, he’s one of our resident cinema experts. He’s doing a wacky sci-fi cinema kind of thing. He’s a huge sci-fi guy and a huge tiki guy and a huge cinema guy. He’s got it all covered! By trade he’s an author, he writes books. He’s put out a new book, a pulp fiction book, The Space Needler’s Intergalactic Bar Guide. He said, “I’ve got to be at Tiki Oasis this year because your theme is the same as my book that I just released a month ago!”. So he’s going to be there. Then there’s Rod Roddenberry, Gene Roddenberry’s son. My friend Jonathan Knowles is going to bring Rod down and they’re going to talk about Tranya and just rip, just really go off and talk about Star Trek stuff. That’s going to be a gem because my friend Jonathan, he actually works for a forward-thinking software company here in the Bay Area and his job is to think of the future for now. He literally goes and hangs out with Google and Facebook and IBM kind of people. He just went to the White House, for example, he’s been to Cape Canaveral and hangs out with NASA guys. He calls them up and says “Hey, what are you doing now?”. His job is to forward think, such as if we are going to have big satellites, are people going to live on satellites that are the size of the moon, or what are we going to be doing 20, 30, 40 years from now. That’s his job! So he’s friends with Rod and they are going to come and just—–their talk is based around the episode Tranya because Jonathan also knows Clint Howard, the actor who plays that character as a kid, the guy drinking the Tranya. The seminar should be awesome! Then there’s fashion, so we have one of the burlesque dancers and costuming people that we know talking about costumes from Fritz Lang to Pucchi, you know, sci-fi fashion design. Q: What about the musical highlights? Well, that’s why I have themes, so I can go out of bounds with the genre. There’s only a certain number of exotica bands out there. Luckily, more have come along, but the big ones like Don Tiki, Aku in the Bay Area, the Blue Hawaiians down in LA, those guys have been around for a while. Now there’s some newer ones, but there’s only maybe a dozen exotica bands in all of America and they’re spread out all over. We do have the Tikiyaki Orchestra from Los Angeles who are an exotica band, but otherwise most of the entertainment is more space-themed and that’s a nice reason to have themes, it allows me to break out of the genre. Our two highlights are the headliners Friday and Saturday. Friday is the Phenomenauts from Oakland. They’ve got matching space outfits like Star Trek looking outfits, they wear helmets on stage and sing about outer space. They have been described as a punk rock, rockabilly Devo! They’re very much like a power-pop kind of thing so they’re not somebody I would book on a tiki show but because of the space show I can get away with it. Our Saturday night headliner is Man or Astroman, who originally landed in Alabama when they first came to Earth back in the early to mid ’90s. They started putting out a bunch of records on Estris and various record labels and became famous for releasing limited edition 7”. They probably have 40 different 7” on 20 different labels all across the world. Many of them are European. They left our planet for a short while and then they returned about ten years ago so they’ve only been touring sporadically, every 2 or 3 years they’ve done another tour. It’s pretty rare to catch them these days and they do kind of like ‘space-surf’ music. It’s like sci-fi surf. Sci-fi surf is a better description maybe if I had to only use one word, ‘sci-fi-surf’ would have to be the word. They have a major light show, they have robots on stage, they have projections of whatever projects they are working on projected behind them. They wear astro outfits on stage, they play really high-energy. sort of sci-fi soundtrack music, usually without vocals but they do have some vocal tracks. They do a cover of the Rezillos song Destination Venus, they do a cover of Mystery Science Theater 3000 which has words and one of their latest hits which is called Anti-matter Man. Other than that, they are instrumental. They are definitely going to be a highlight! And of course the Sunday show with the Chocolate Watchband! Q: What’s your favorite Tiki cocktail? Well, in conjunction with this year’s theme, we have to go with the Jet Pilot. It’s a ‘Don the Beachcomber’ drink and it’s a classic! Q: What special shows will you have? We have an art show in our lobby, it is curated so we have artists from all over the world. Last year we had a guy from Brazil and this year we have a guy from Japan, so it’s a real art show with artists and art that people can buy. Every year the art is always the art of the theme. Last year was Beatnik, the year before was ‘Hulabilly’, you know Western rockabilly and this year it is Space. It’s actually cool for the artists—-I get artists who say ‘I love doing your art show because you provide the inspiration with the theme and then I just riff off of it’. We’ve already handed them the idea of what to do so it’s not just another art piece or another tiki piece or doing another thing like they did for another art show. It gets them excited about it too. Q: Rum’s going to have a big presence at Tiki Oasis again won’t it? 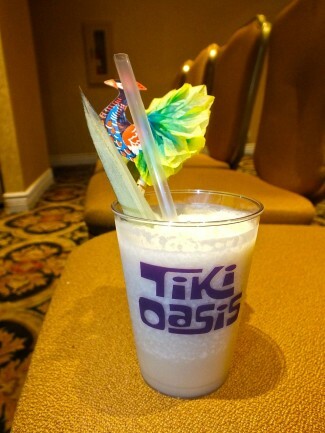 (Big laugh) Of course, Tiki Oasis is a rum drinking event! That is what it is, it’s a cocktail event a rum drinking event and we always have a good selection of rum sponsors and we have Martin Cate, who is probably the West Coast expert on rum. He comes every year and this year he is presenting an actual rum tasting of some of his favorite hard-to-find rums. Tiki Oasis will be full of fun——the most fun you can have on this planet! There is even a Miss Tiki Oasis contest, a Tiki Oasis tradition that is not to be missed. Whether you come for one day or all four, you’ll have lots of fun at Tiki Oasis. This entry was posted in Art, Attractions, Cocktails, Beer & Wine, Events, Fashion, Interviews, Miscellanious, Music, News & Sports, Science & Technology, Upcoming Events and tagged Ed Simon, Man or Astroman, Otto von Stroheim, Phenomenauts, San Diego, Space Age, Star Trek, Tiki Oasis. Bookmark the permalink.